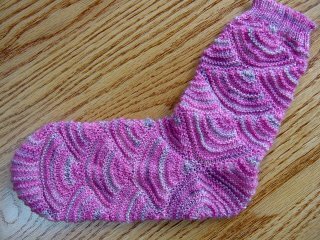 Cindy's Fiberworks: Two Socks Finished, But Not a Pair! Color Blox Sox from Six Sox KAL. The striped is Trekking XXL and the salmon is Lang Jawoll. Knit on #0 dpns, 64 st. I am a toe-up sock knitter, normally, but I have never done the garter stitch cuff, and it is very nice, particularly with striped yarn. The next sock is the "Fanning the Flames" sock. It fits very well, which suprised me. 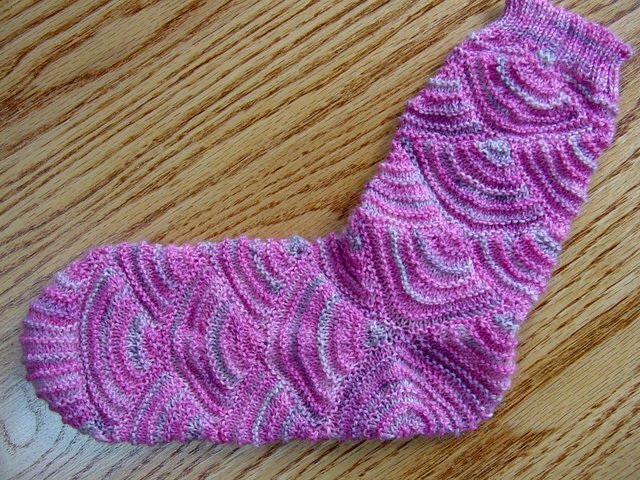 After knitting half the sock, I realized that I could use both ends of the yarn to knit successive fans, which cut the number of ends to weave in by half! I love it. All of your projects are just BEAUTIFUL!! You do such lovely work! These fan socks look soooo difficutlt! You most certainly may use the "Pick a pair" coupon idea. People really like it, once they figure it out!! 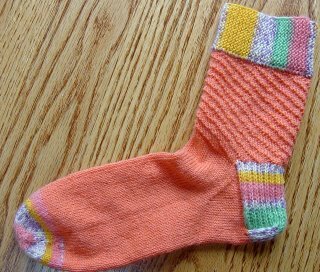 I am usually color-shy, yet love to work with bright colors, so all the socks I don't want to keep, find homes eventually also. Works for me!! Sizes vary also - which is nice.